Esther Inglis (1570/71-1624) is now regarded as one of the finest calligraphers to have worked in England and Scotland during the early modern period. As Gillian Wright on the Perdita Project (2004) points out, Inglis may have learnt her calligraphic skills from her mother, Marie Presot, who was also an accomplished scribe. According to Georgianna Ziegler (2017), sixty-three of Inglis’s manuscripts are known to be extant. Inglis’s manuscripts typically consist of religious texts which are beautifully decorated with floral or animal patterns (see Tjan-Bakker 2000). RECIRC has included Inglis as an author on its database because she wrote dedicatory epistles and composed at least one poem, ‘Priere a Dieu’ (‘Prayer to God’, see Stevenson and Davidson 2001: 125). 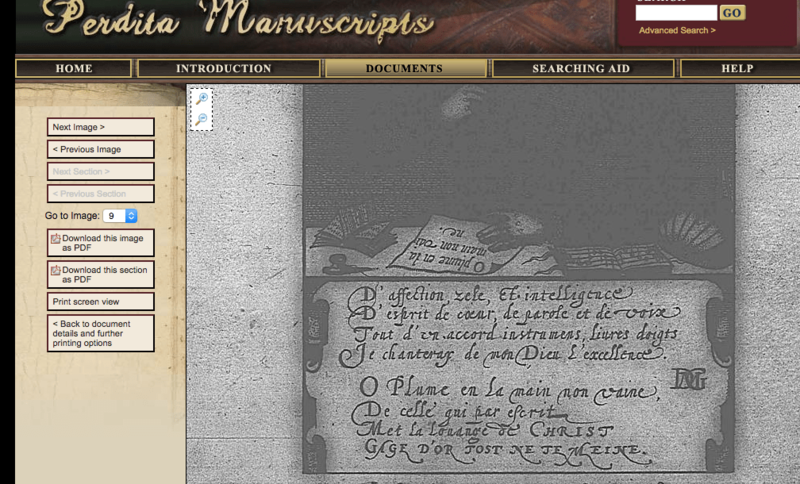 Digital reproductions of some the manuscripts that Inglis created are now available online. Today I would like to talk you through four of these digital reproductions. Perdita Manuscripts (subscription required) has been built in association with the open-access Perdita Project. Perdita Manuscripts comprises of complete grey-scale digital facsimiles of over 230 manuscripts produced by women, 1500-1700. Perdita have included twenty-one of Inglis’s manuscripts in their digital library. 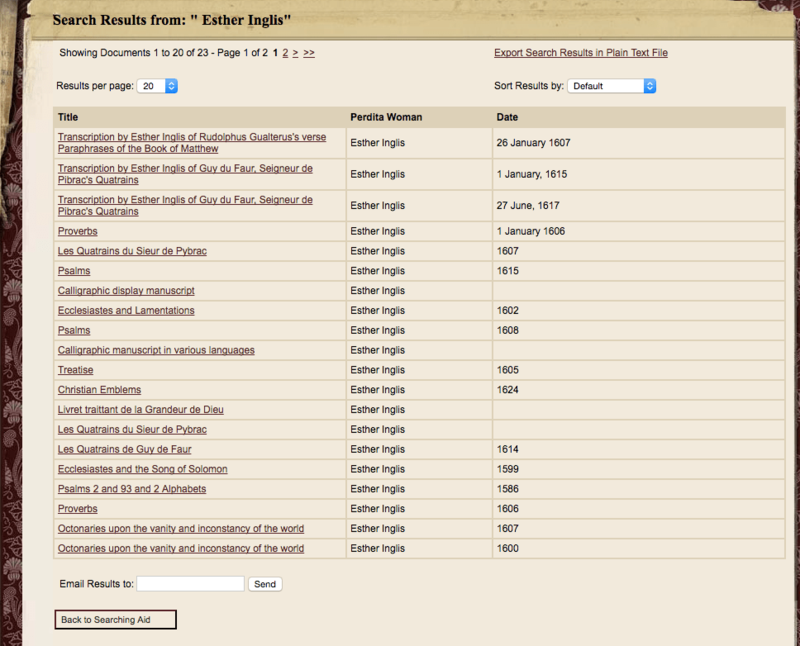 Search results for ‘Esther Inglis’ on Perdita Manuscripts. My favorite Inglis facsimile on Perdita Manuscripts has to be the Emblemes Chrestiens (1624, British Library, MS Royal 17. D. XVI). This is a restricted item in the British Library, so Perdita has done scholars, teachers and students a real service by reproducing this grey-scale facsimile for their digital library. In this manuscript Inglis transcribes two poems by the French author, Georgette de Montenay. Inglis also includes in this manuscript fifty-one emblems from Montenay’s printed work, Emblemes ou devises chrestiennes (first printed in 1567, with four subsequent editions to 1619). Grey-scale facsimile from Perdita Manuscripts, showing Inglis’s transcriptions of two of Montenay’s poems. Inglis’s manuscript version of the Emblemes Chrestiens offers an exquisite example of how one female writer, Inglis, was reading, adapting and receiving the work of another Renaissance female author, Georgette de Montenay (see van Elk 2009). 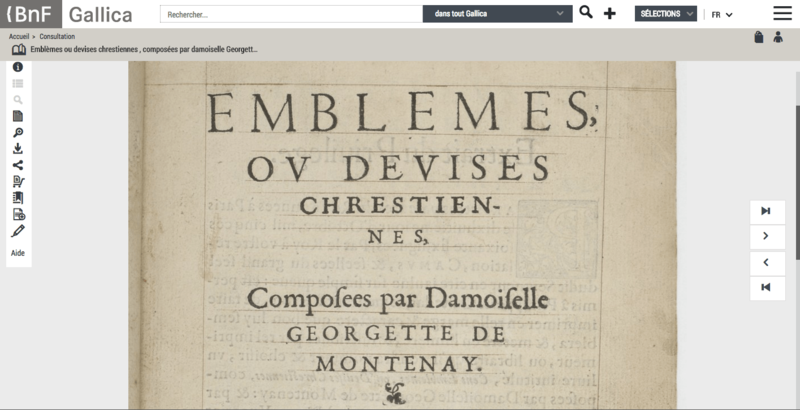 Montenay’s printed Emblemes can be viewed digitally via two open-access online resources: French Emblems at Glasgow and the Universal Short Title Catalogue. Title-page, Georgette de Montenay, Emblemes ou devises chrestiennes (Lyons, 1571), from Gallica (via the Universal Short Title Catalogue). The above-cited digital texts of Inglis and Montenay are great tools for teaching. We can now show our students in tandem (without leaving the classroom) two different texts by two different women – one of whom was inspired by another. Moreover, examining Montenay’s digitized printed book alongside the facsimile of Inglis’s manuscript can throw up in the classroom interesting questions about the differences and similarities between print and manuscript production. LUNA is the Folger Shakespeare Library’s open-access digital image collection. It contains over 100, 000 images from the Folger’s collections. LUNA includes cover-to-cover colour images of two of Inglis’s manuscripts: MS V. a. 91 and MS V. a. 92. Both of these manuscripts are titled Octonaires upon the Vanitie and Inconstancie of the World and are dated to 1600 and 1607 respectively. MS V. a. 91 contains a now well-known self-portrait by Inglis and the digital reproduction’s zoom function allows you to get up close and personal with Inglis’s techniques as portraitist. Esther Inglis, Self-portrait, Folger Shakespeare Library, MS V. a. 91, verso of title-page. Accessed via LUNA. MS V. a. 92 includes two sonnets about Esther Inglis and these have been digitally reproduced by the Folger. These two sonnets are attributed to G. D. in the manuscript. In the second of G. D.’s sonnets, the speaker praises Inglis for being the ‘matchles Mistresse of the golden Pen’ (f. 5r). MS V. a. 92 not only captures Inglis’s practice as a scrivener and illustrator, but also includes fascinating early modern receptions of her by her contemporary, G. D. These two sonnets by G. D. are written in Inglis’s hand and the high-resolution digital images of this manuscript allows us to carry out a detailed examination of Inglis’s handwriting. G. D., ‘To the only Paragon, and matchles Mistresse of the golden Pen’, Folger Shakespeare Library, MS V. a. 92, f. 5r. Accessed via LUNA. Christ Church Library and the Bodleian Library have joined efforts in a new digitization project with the aim of opening up the repository of manuscripts and early printed books at Christ Church. Over the next few years, thousands of pages from this collection will be made freely available online. One of the manuscripts that Christ Church has already digitized and made available online is Esther Inglis’s Le Livre des Pseaumes (1599, MS 180). This is a colour cover-to-cover reproduction. ‘Priere a Dieu’, Christ Church, MS 180, p. 155. Accessed via the Christ Church Digital Library. Moreover, Inglis fans will be thrilled to have at their fingertips a high-resolution digital reproduction of the embroidered book cover of Le Livre des Pseaumes. We can now get comfortably close to Inglis’s own embroidery. The pearls alone will make you swoon! Detail from binding, Christ Church, MS 180. Accessed via the Christ Church Digital Library. Inglis, Esther, Ce livre contenant cinquante Emblemes Chrestiens premierement inventez par la noble damoiselle Georgette de Montenay en France, forts plaisants & delectables a lire & voir lesquels sont, a present, escrits, tirez, et tracez, par la main et plume de moy Esther Inglis l’an de mon aage cinquante et trois. A Lislebourg en Ecosse, l’an 1624. British Library, London, MS Royal 17. D. XVI. <http://www.amdigital.co.uk/m-products/product/perdita-manuscripts-1500-1700/> [subscription required, accessed 21 June 2017]. Inglis, Esther, Le Livre des Pseaumes escrites en diverses sortes de lettres par Esther Anglois francoise. A Lislebourg en Ecosse 1599. Christ Church, Oxford, MS 180. <http://digital.bodleian.ox.ac.uk/inquire/Discover/Search/#/?p=c+5,t+dcterms%5C%3Asource%3A%22Christ%20Church%2C%20Oxford%22,rsrs+0,rsps+20,fa+,so+ox%3Asort%5Easc,scids+,pid+9c90861e-1944-46b4-bc20-e9f5affd6f3c,vi> [accessed 21 June 2017]. Inglis, Esther, Octonaries upon the Vanitie and Inconstancie of the World. Writin by Esther Inglis, the first of Ianuar 1600. Folger Shakespeare Library, Washington DC, MS V. a. 91. <http://luna.folger.edu/luna/servlet/view/search?sort=Call_Number%2CMPSORTORDER1%2CCD_Title%2CImprint&q=Call_Number%3D%22v.a.91%22+LIMIT%3AFOLGERCM1~6~6&pgs=250&res=2> [accessed 21 June 2017]. Inglis, Esther, Octonaries upon the vanitie and inconstancie of the world, writin and limd be me, Esther Inglis the xxiii, Decemb: 1607. Folger Shakespeare Library, Washington DC, MS V. a. 92. <http://luna.folger.edu/luna/servlet/view/search;JSESSIONID=ee6802fe-7d70-4f18-98bc 3380b48f2c5d?sort=Call_Number%2CMPSORTORDER1%2CImprint&search=Search&q=Call_Number%3D%22V.a.92%22+LIMIT%3AFOLGERCM1~6~6&QuickSearchA=QuickSearchA&pgs=250&res=2> [accessed 21 June 2017]. Frye, Susan. 2002. ‘Materializing Authorship in Esther Inglis’s Books’. Journal of Medieval and Early Modern Studies 32: 469-91. Frye, Susan. 2010. Pens and Needles: Women’s Textualities in Early Modern England. Philadelphia: University of Pennsylvania Press. Montenay, Georgette de. 1571. Emblemes ou devises chrestiennes. Lyons: Jean Marcorelle. <http://www.emblems.arts.gla.ac.uk/french/books.php?id=FMOa> and <http://ustc.ac.uk/index.php/record/2518> [both accessed 21 June 2017]. The Perdita Project. 2004. <https://web.warwick.ac.uk/english/perdita/html/> [accessed 21 June 2017]. Scott-Elliot, A. H., and Elspeth Yeo. 1990. ‘Calligraphic Manuscripts of Esther Inglis’. Papers of the Bibliographical Society of America 84: 11-86. Stevenson, Jane, and Peter Davidson, eds. 2001. Early Modern Women Poets (1520-1700): An Anthology. Oxford: Oxford University Press. Tjan-Bakker, Anneke. 2000. ‘Dame Flora’s Blossoms: Esther Inglis’s Flower-Illustrated Manuscripts’. English Manuscript Studies, 1100-1700 9: 49-72.
van Elk, Martine. 2009. ‘Courtliness, Piety, and Politics: Emblem Books by Georgette de Montenay, Anna Roemers Visscher, and Esther Inglis’. Early Modern Women and Transnational Communities of Letters, edited by Julie D. Campbell and Anne R. Larsen, 183-212. Aldershot: Ashgate. Ziegler, Georgianna. 2000. ‘Hand-Ma[i]de Books: The Manuscripts of Esther Inglis, Early Modern Precursors of the Artists’ Book’. English Manuscript Studies, 1100-1700 9: 73-87. Ziegler, Georgianna. 2000. ‘‘More Than Feminine Boldness’: The Gift Books of Esther Inglis’. Women, Writing, and the Reproduction of Culture in Tudor and Stuart Britain, edited by Mary E. Burke, Jane Donawerth, Linda L. Dove, and Karen Nelson, 19-37. Syracuse: Syracuse University Press. Ziegler, Georgianna. 2017. ‘Princely New Year’s Gift? A Newly-Discovered Manuscript’. 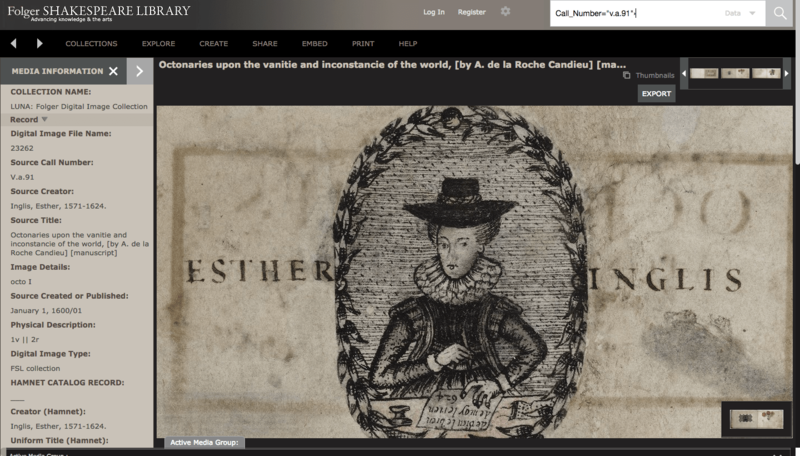 <http://collation.folger.edu/2017/01/princely-new-years-gift-newly-discovered-manuscript/> [accessed 21 June 2017].